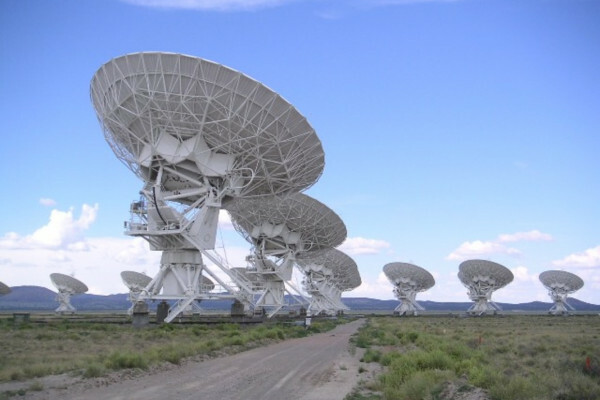 Ben - The Square Kilometre Array, or the SKA, is set to be a groundbreaking new radio telescope operating at a wide range of frequencies, with as much as 50 times more sensitivity than any existing telescope of its kind. It should help us to answer some of the really big outstanding questions about our universe. Now the headquarters will be based at the Jodrell Bank Observatory in Cheshire but the telescope itself is either going to be located in Australia or in South Africa. This week, Bernie Fanaroff, the project manager for the South African SKA bid, visited London and met up with our own Chris Smith. Bernie - It will be made up of two different kinds of what are called receptors. Most people will know what a satellite dish looks like. A satellite dish is really a mirror. It focuses radio waves from space onto a radio receiver. There'll be another kind of receptor which is more like a fish eye lens. It sits on the ground. You don't stir it physically, you stir it electronically, but it sees almost all of the sky all the time. So the Square Kilometre Array will be made up of a couple of thousand dishes and a thousand or so of these fish eye lenses. The dishes will be spread out over about 3,000 kilometres. The fish eye lenses are over a couple of hundred kilometres. They'll all be joined together with optical fibre, so they all look at the same thing at the same time. You feed the signals from all of these dishes and fish eye lenses together into one central computer. You can then process the data to make a picture of whatever it was that they were looking at. Chris - That must be one mega computer. Bernie - Well, the estimates are that you'd have to have a computer running at exoflop speeds. Exoflop speeds is of the order of a thousand times faster than the fastest super computers now. The data transport would be several hundred terabits per second, so you're looking at a couple of hundred times more data traffic than you have through the entire worldwide web at the present time. So it pushes a lot of technological boundaries. Chris - So why South Africa? Bernie - Well first of all, we have an exceptionally good site. It's very quiet, radio quiet, in a sense that there's very little interference. We've been able to work with our signal broadcasters and our mobile phone operators as well as others, to reduce even further any signals that there are. So it's a very quiet site. The physical characteristics are good. We have large flat areas, temperatures and winds are benign. There's no extreme weather and there's a lot of infrastructure already in place so it's easy to put it down there. It also reduces the costs because the cost of construction is low. You've got some infrastructure but also, building in South Africa is just more affordable than it would be in many other places. Chris - Is South Africa ready for this kind of project though? Because to develop that kind of computer and that kind of infrastructure, can the country deliver that at the moment? Bernie - Well, we certainly can. First of all, we've got quite a good base of high tech industry as well as construction engineering industry with an international track record. We've done two things which have helped us to develop a really vibrant and world class community. The first one is that we've been building what we called a MeerKAT telescope which is a scaled down version of the Square Kilometre Array. It will have 64 dishes instead of a couple of thousand of them and will be on the same site in the Karoo. We've built the first 7 dishes and we're commissioning that as a prototype. Then, going with that, we've developed a big bursary and grants program to strengthen our universities. We have 5 research chairs in our universities. We've had 117 PhD and MSc students in engineering and astronomy. We've got about 100 undergraduates in physics and engineering and we're training new technicians and artisans. One of the things which has become clear is that the 100 or so young engineers and scientists who directly work on the project now, I'm excluding the ones in the university, are amongst the best engineers and scientists in the world. That has been recognised by the rest of the SKA International consortium. Chris - And if it does go South Africa's way, what will this mean to the country if you get this? Bernie - I think it'll be very important for us. First of all, it'll change the way we see ourselves. We'll see that we can be a centre for science and astronomy and one of the government's objectives from 1996 is for Southern Africa to be a centre of astronomy. The other thing is that I think it'll change the way the world sees us. We're already seeing a lot of very good academics and researchers wanting to come to South Africa to work on the MeerKAT and that wasn't easy a few years back. If we have the SKA in Africa we'll have more of those people coming in. That will strengthen our innovation system, our universities, and it will just strengthen the whole capability in these hi-tech and scientific areas. Chris - And what are the really big questions that you're going to answer with this? Bernie - The first one I think is that people would like to understand dark energy better. Why is the universe expanding faster and faster? What is the large scale structure of the universe? It has voids in it, bubbles, how do the bubbles originate? What has happened to the structure of the universe over the life of the universe? It will enable us to study galaxies and how galaxies form and evolve so that we can understand better what dark matter is. Both dark energy and dark matter are known to be there because we can see their effects, but we don't know what they are. So that is a very interesting challenge. It will also test Einstein's theory of gravitation by enabling us to look for gravitational waves and by enabling us to study what happens really close to black holes. It'll look for protoplanets. These are all very exciting questions. Ben - Bernie Fanaroff talking to Chris Smith at the South African High Commission this week. Regardless which country, the SKA is planned to start construction in 2016 and should be fully operational by 2024. It'll be very exciting to see if that happens, and if it does, the results that they start getting.